Who am I? Apart from my obvious belonging to the sea-elf people, I can't tell my origins, and my life began for me on the day the sea-elf farmer Arkas, my adoptive father, found me in a coral forest as I was only a baby. Arkas and his wife Myriam brought me up with their daughter Esmeralda until I was ten years old. They decided then to send me to their cousin Eggron who lived in Waterdeep, a sea-elf city located in the depths of the Dragon sea. There I could receive a more proper education, fit to those skills Arkas said he was seeing in me. I joined the royal academy, where I first studied weapons and strategy with Oceanus, the chief of the guards, a hard but frank master. But that was not what I aimed for... I just wanted to know my origins and spent all my free time in the royal library seeking clues. I was quickly noticed by an old sea-elf, Cornelius. He took me under his protection and decided to help me in my quest of identity. He showed me ancient tablets which told the story of the "founders". 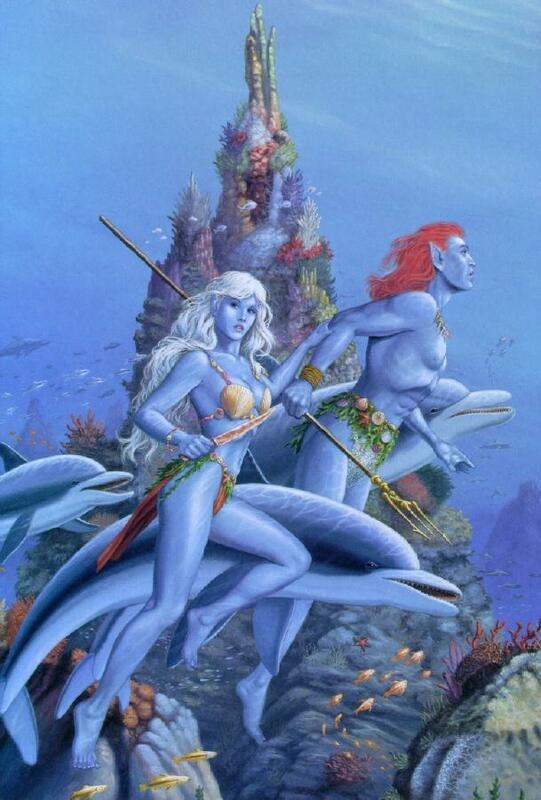 Here what I roughly managed to remember: "A long time ago some people, called the "founders", helped the sea-elves to establish the underwater civilisation. They were considered as superior beings because of their incredible knowledge and their strong magical potential, and people recognized them to the uncommon color of their hair, as red as a coral. Some people said that they came from a large land, which had sunk into the ocean, or that they are able to breath air and water... but it's difficult to know the part of truth. One day they decided to leave, judging the sea-elves had no more need of them. It was the last time people heard stories about them..."
Actually Cornelius though I belong to this kind of people, due to my physical apparence and my uncommon behaviour. He decided to teach me the bases of magic to know if I was one of them. I overwhelmed all his hopes: in a few weeks the student exceeded the master. But this learning had released something within me: a deep unknown power which seemed to be absolute... and frightening... A cursed inheritance. Cornelius recommended me to leave the submarine world to seek a solution and recover control of it. I spent a lot of time, roving without aim, frightened about myself, of what I had become. During a long time, my only shelter was the lighthouse of Sanctuary: I remember hours spent with Abram, the lightkeeper, just looking at the open sea, breathing the foam and listening to the powerful waves shattering on the rocks. Then, I met Feyd the Elven Prophet and it was a change in my life. He showed me the way of Galanhir. He gave me the willpower to act on my destiny and revealed me the way to control myself: I had to achieve Wizardhood. I visited the world, trying to help and protect life and met a lot of people: Gnum, GreatWondy, Xtatic, Antirak, Dorwin, Ishtar... who opened my mind to a new consciousness. I finally managed to be an immortal, and control my inside force, now a pure and quiet source on which I can settle my power.